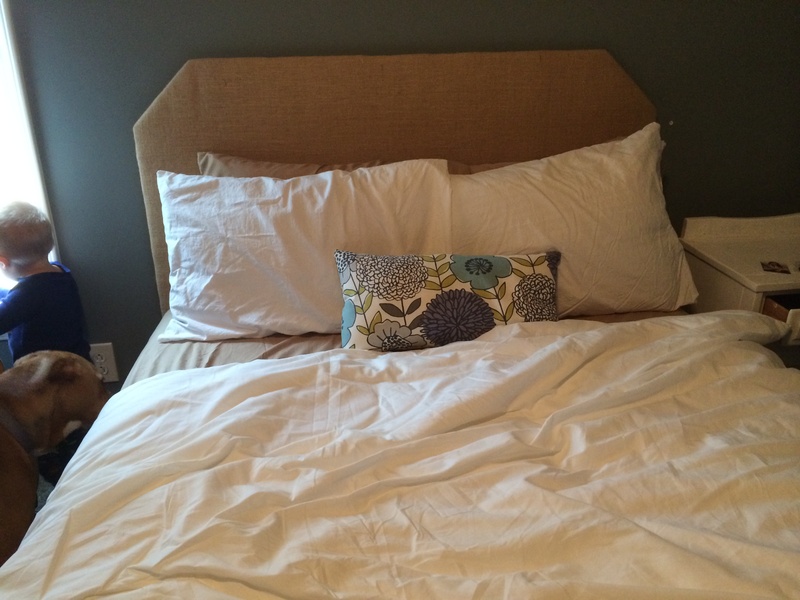 I realized today that I never updated the blog with the completed upholstered headboard. To give it a finished touch, I hammered in bronze furniture nails. Easier said than done… I’m not sure if it was the plywood, the nails, my lack of muscle, or (most likely) a combination of the three, but this took FOREVER! I realized quickly that I lack the ability to eyeball a straight line, so I used my water soluble embroidery pen and a straight edge to make a guide. I then used my thumb to space out the nails. 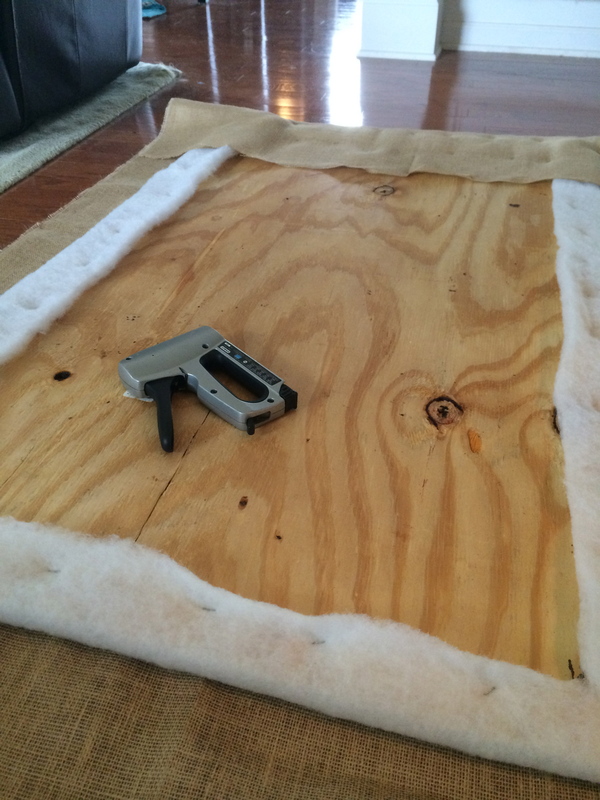 The burlap was forgiving and hid all the holes from the many (MANY) nails that needed to be removed. Most nails would go in fine until at first and then bend. After the fact, I talked with a friend who does this often and said she pre-drills holes. So here it is- the good, the bad, and the ugly. No blood was shed during this project, so I consider that a win, and I love the finished product, but I’n in no rush to use finishing nails again. Like so many others, our guest bed was just a mattress and box spring. It served it’s purpose, but wasn’t anything fancy. I’ve mentioned before, I’m a huge fan of HGTV. I love design shows, especially those that show you how to complete projects yourself. That paired with pinterest is a dangerous combination. Thankfully this project was simple and cheap to complete. 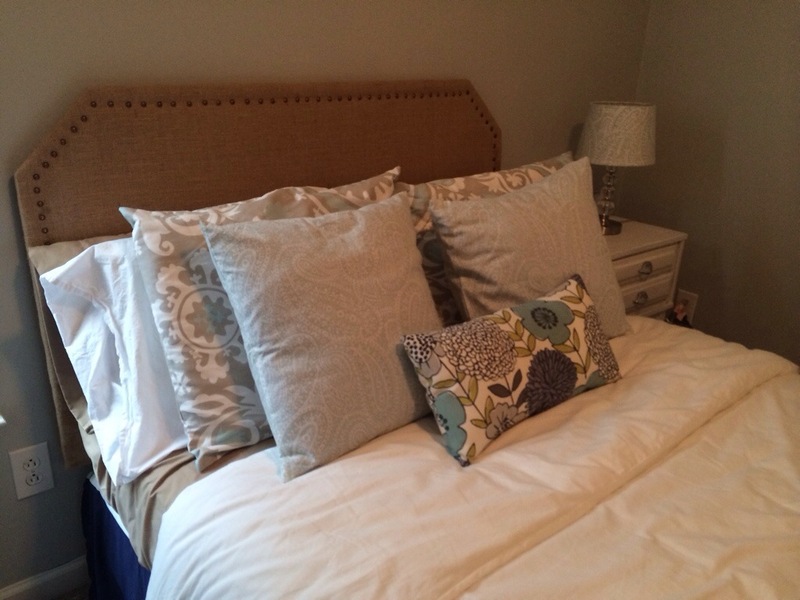 First, I positioned the pillows on the bead and measured how far I wanted the headboard visible. Looking at other headboards, I measured up from the top of the box spring/bottom of the mattress, and decided on 32″ high. 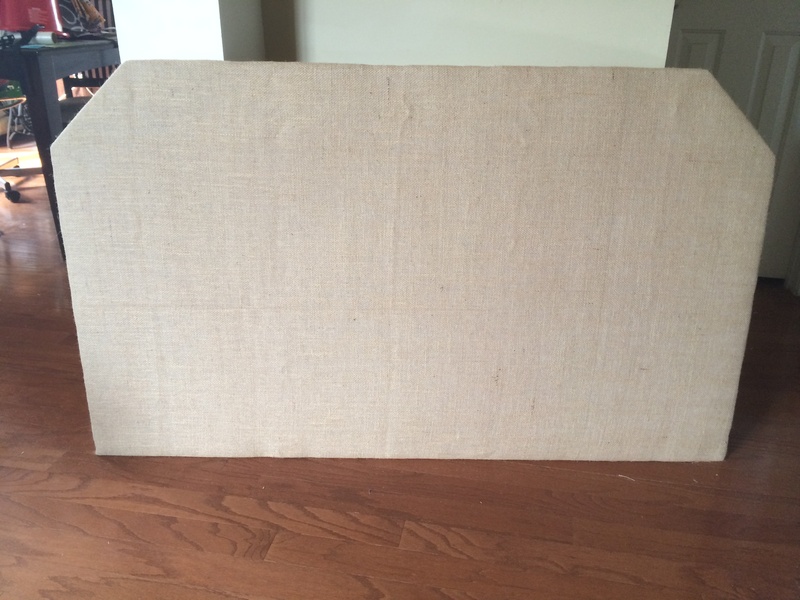 I then measured the width of the box spring and added 2 inches (one for each side), and decided on 54″ wide. 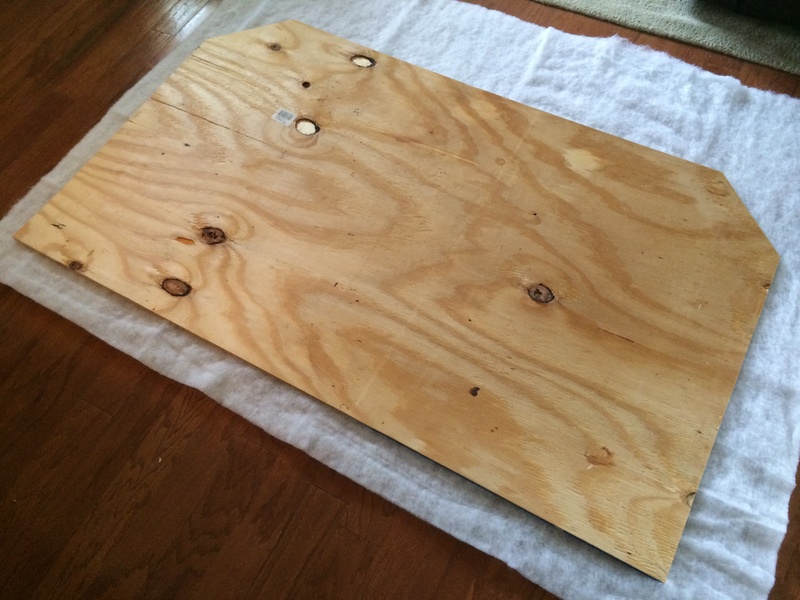 I gave these numbers to my super handy husband, who had picked up a piece of 1/2″ plywood earlier in the week. 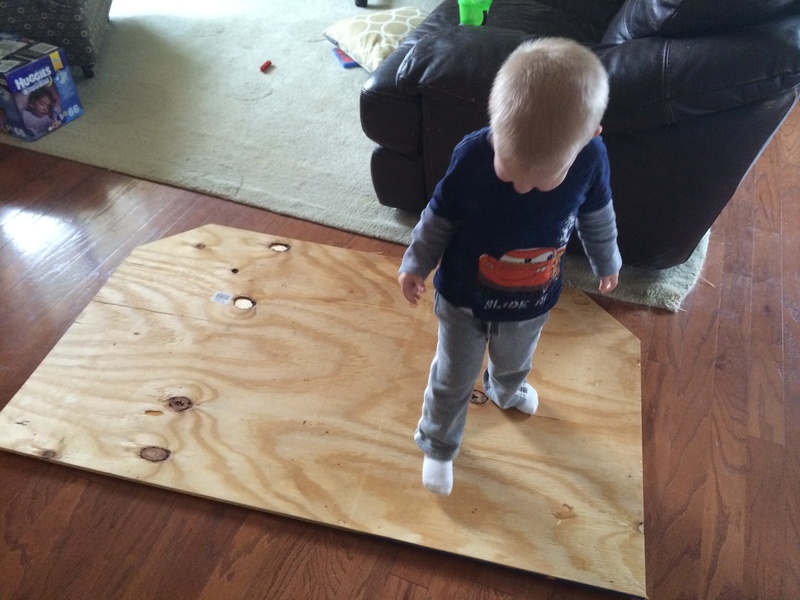 He quickly cut the rectangle, and then using a handy-dandy triangle thingie, we angled the corners at 6″. 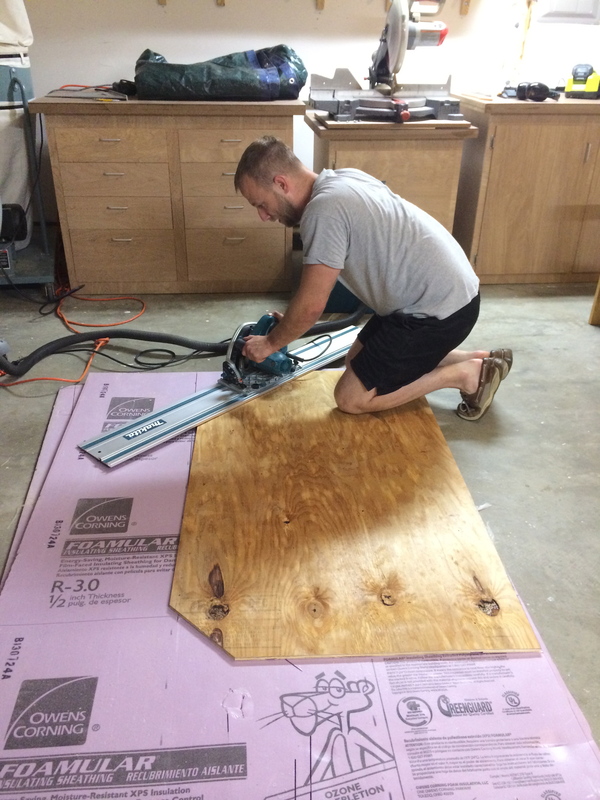 Once the wood was cut to size, we brought it inside. I laid my batting on the floor and smoothed out all wrinkles, put the headboard on top, and used a staple gun to secure it to the back. 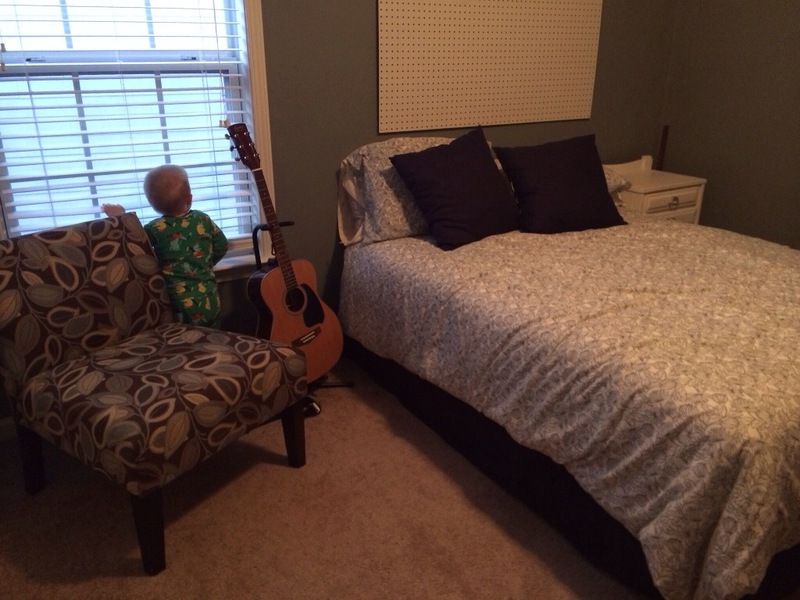 I purchased a polyester batting with extra loft that was crib size, and it worked perfect for the full size headboard. On all of my quilts, I use 100% cotton batting, but that is more expensive, and I figured for this project, the polyester was fine. That was $9.99 from Hobby Lobby, but 30% off, so I got it for $7. I went back and forth on what fabric to use on the headboard. I thought about a printed home decor fabric, but that kinda limited me on my bedding. I thought about something solid, but couldn’t decide on a color, and I wanted something with dimension. I then decided on burlap. I wasn’t sure how it would do since it’s textured and you can see through it, but I had some from other projects, and pairing it with the batting looked great. Plus, burlap is super cheap. I purchased 2 yards from Hobby Lobby and used a 40% off coupon, bringing my fabric total to $6. Whoot whoot!! 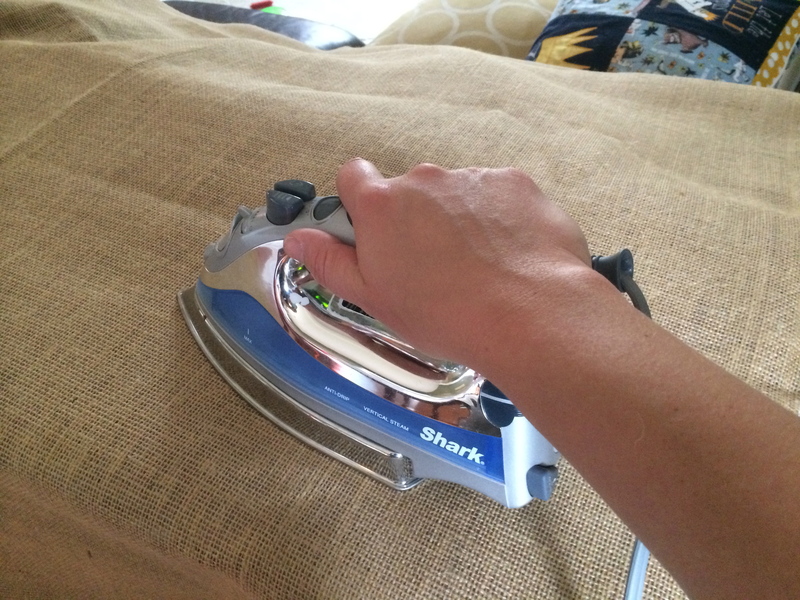 The burlap had some noticeable wrinkles, so I ironed it the best I could, spread it flat on the floor, put the headboard on top of it, and stapled the burlap to the back just like I did with the batting. 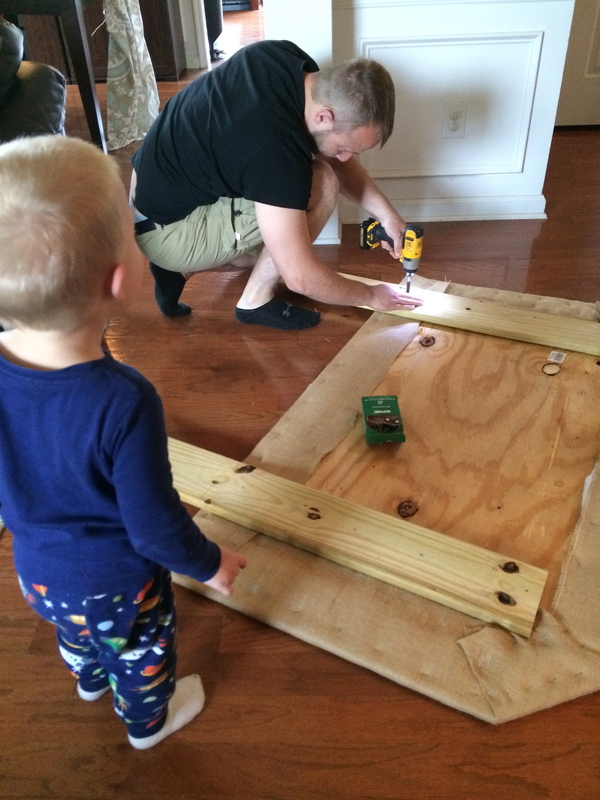 We attached legs to lift the headboard up behind the box spring. 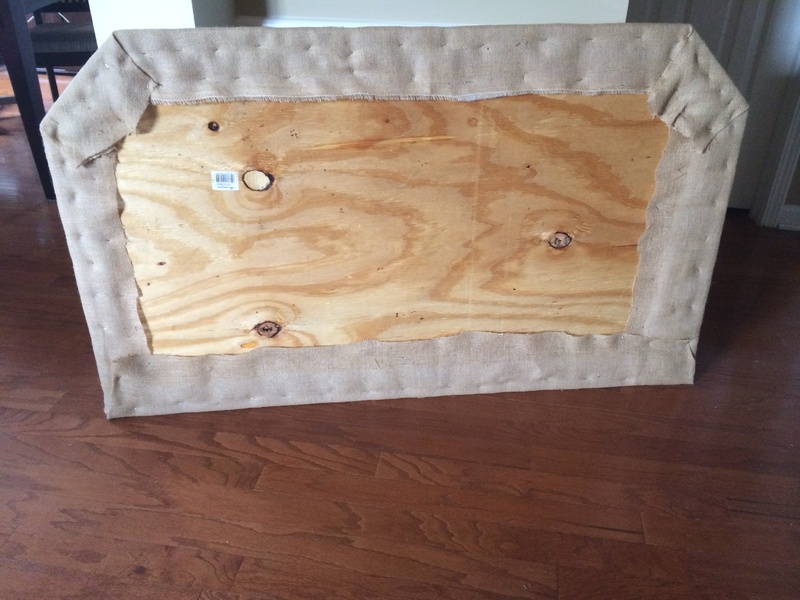 The headboard now rests against the wall, but is supported by the box spring and mattress. I’m thinking about adding decorative copper finishing nails around the border of the headboard, but that won’t come till later. Pillows were my project for today, so I’ll post an updated picture of the bed soon. I hope I inspired someone else to take on this project. I am grateful to my husband for his help!!! We’ve been in our house just over 8 years. Crazy to think we’ve been here that long. In that time our guest room has gone through several changes. It was first a guest room, then man-cave/office, then a guest room/office, and now it’s back to a dedicated guest room. I love watching DIY shows and HGTV. I love decorating, especially when it involves me sewing something. 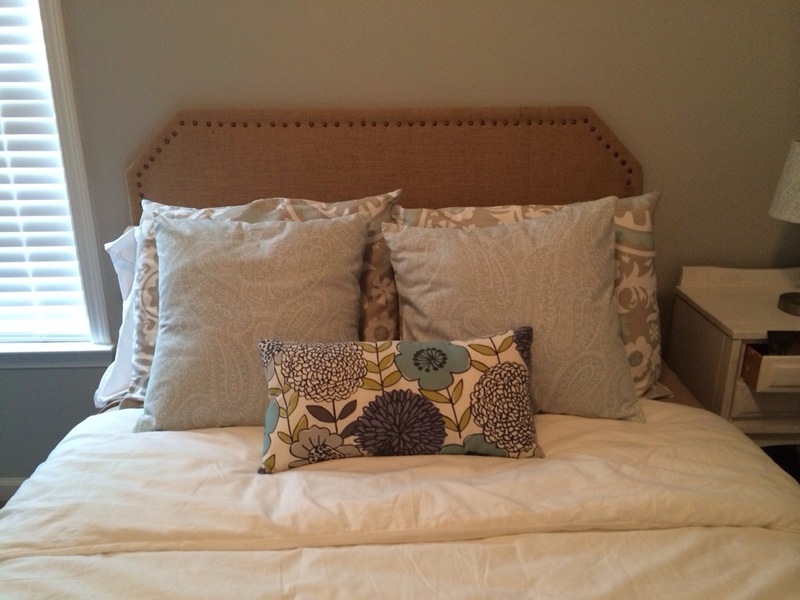 A few weeks ago, I got the idea that I wanted to make an upholstered headboard for the guest room. My husband OKed this project. I then decided I needed to paint the room. He OKed that project too. Somewhere along the way the project went from paint and a headboard to those, plus new bedding and pillows, window treatments, and a new chair. 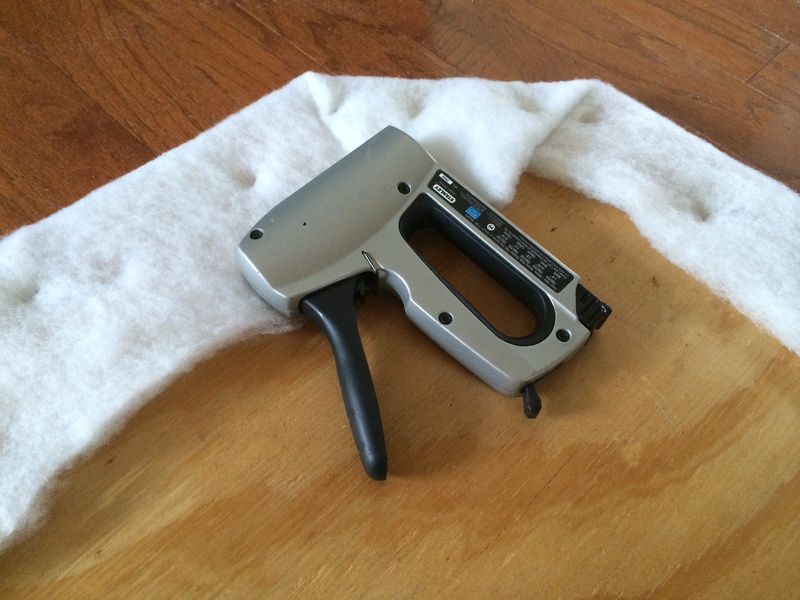 (Adding the new chair involves moving the existing chair downstairs and reupholstering it… Another post for another day). If you’re still reading, hats off to you! Today, I made the trip to Ikea for the new duvet cover. If you aren’t fortunate enough to live close to an Ikea, I’m sorry. It is seriously one of my favorite places. I was able to bribe my mom to meet me and Zac there today to help. Ikea with a 2-year-old is not something I ever want to do alone. I plan on blogging along with each step of this project, so stay tuned for updates! I got an email today that the fabric for my pillows shipped. I feel like a kid on Christmas! 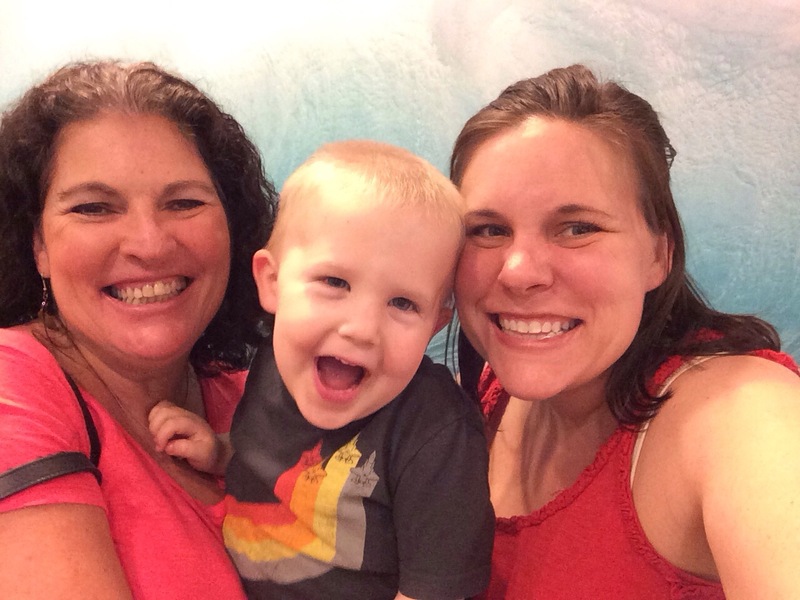 No blog post is complete without pictures. First is my “before”. You can see the peg board on the wall from when it was my husband’s man-cave/office. The chair that is there is moving downstairs and I have a super awesome vintage rocking chair that is taking it’s place. I’ve also included a selfie of us from Ikea today. 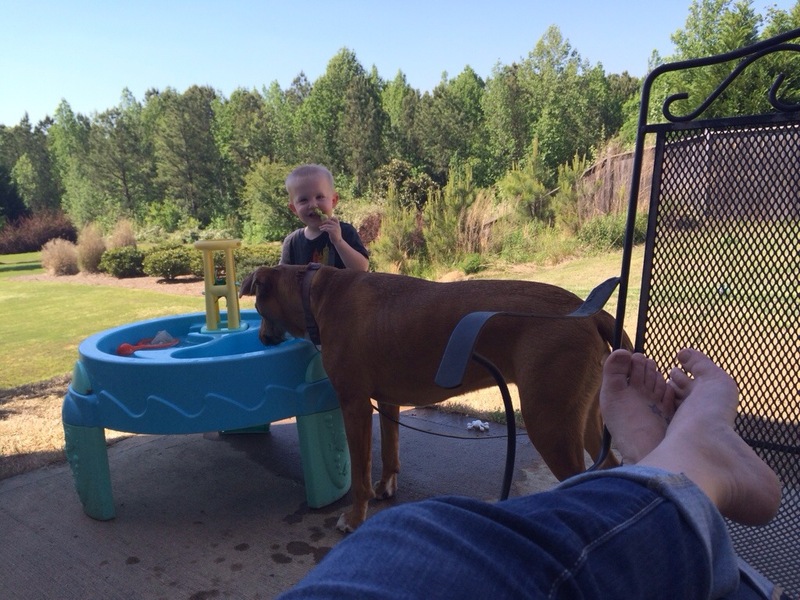 I am typing this out as I sit in the backyard, so I’ve included a picture of that too.